In addition to the proactive customer engagement from the Casino Scouts trigger based marketing engine, the native Android and iOS apps provide valuable service and support when on the casino floor. Let's take a look! Casino operations has the ability to define areas which are served by specific food and beverage operations, and the available menu items associated with those locations. 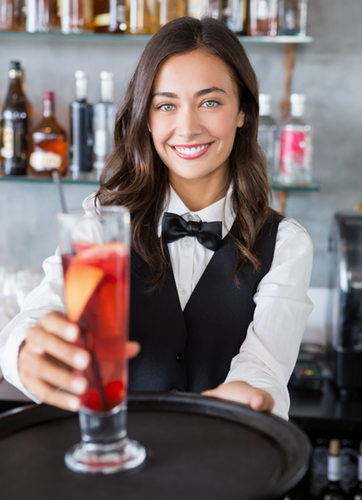 This information, combined with our precise location awareness, allows customers to order a drink without needing to be aware of which bar service area you're in. The app presents you with just the options that are available to you, where you happen to be. Our low energy bluetooth grid allows us to provide point to point navigation from wherever you are, to where you want to be, right on your phone. Just select where you want to go from a list on your phone, and the app will generate a path for you, right on the map! This feature allows casino operators to configure food and beverage outlets that will allow customers to wait in line virtually, by requesting seating in the app. This feature can be made available to all app users, or limited by customer type (e.g., VIPs). This can be extended as specifically as, for example, "Anyone can do virtual line waiting at the cafe, but only VIP customers can do virtual line waiting at the Italian restaurant." Customers will be notified by the system when they need to start wrapping up what they're doing and head to the restaurant, and when they are ready to be seated. Marketing can also define specific hours when virtual line waiting is allowed, which is a good idea for a variety of reasons. Casino Operators can publish information on their property and its amenities, including photos, descriptions, menus, hours of operations, and all manner of details commonly asked about, by customers. Information that is updated by the marketing team is immediately published to the mobile apps, without any need to update the software.